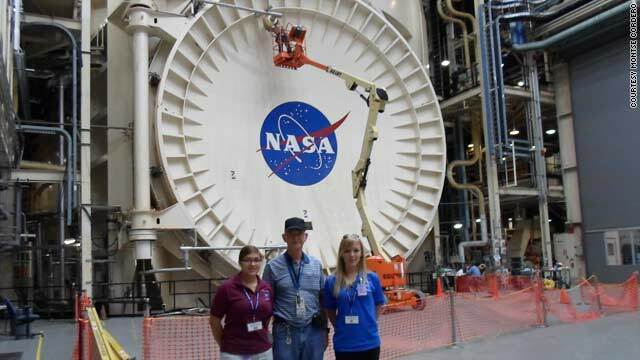 Montse Cordero, left, with her housemate Alex Carney, right, in front of the vacuum chamber at Johnson Space Center. Editor's note: Montse Cordero is a 17-year-old student from Costa Rica participating in the Foundation for International Space Education's United Space School, a two-week summer program in Houston. She'll be blogging about her experiences in the program here. Need to catch up? Check out all her previous posts here. I'm starting to get the feeling that all of these posts start the same way, but it's for a good reason: Every day is absolutely amazing in its own way! Today started early again. Before school, our host took us to see some big vacuum chambers used for testing at Johnson Space Center. There are two chambers in the building: one, that is pretty gigantic, where they will test the James Webb Space Telescope, and another one that’s smaller. The smaller one is actually human rated, so they’ll test space suits there (with people inside!). The big one takes over 12 hours to reach testing level of vacuum, and the smaller one will take more than eight. They are both quite impressive, we really enjoyed seeing them and learning about them.